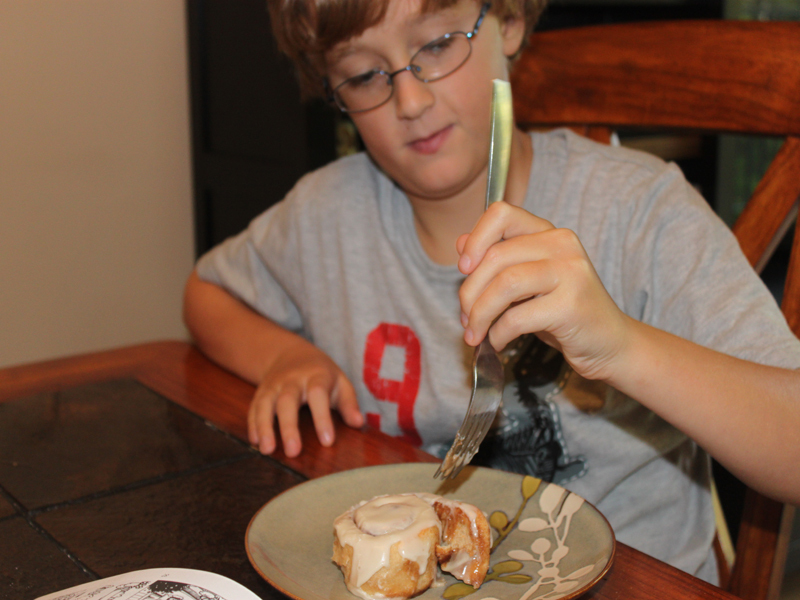 My son loves cinnamon rolls, but since most are chock full of white flour, sugar and fat, we rarely indulge. However, last weekend he begged me to make a batch. I was determined to make a batch that was organic, vegan, made with whole-wheat <em>and </em>still delicious. I'm happy to report that these cinnamon rolls fit the bill - and while we won't be eating cinnamon rolls everyday in our home, these are a great vegan alternative for those times that we feel like a sweet treat! 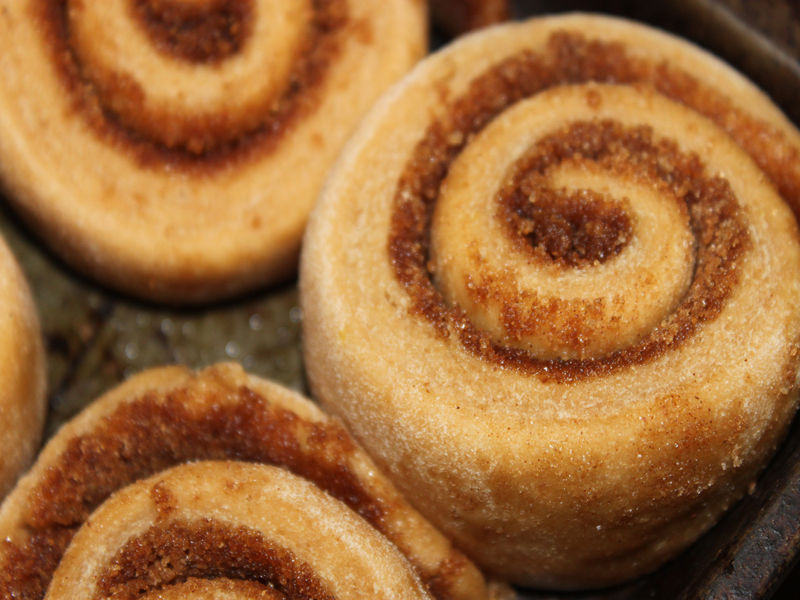 Read on to learn how you can bake organic vegan whole-wheat cinnamon rolls. 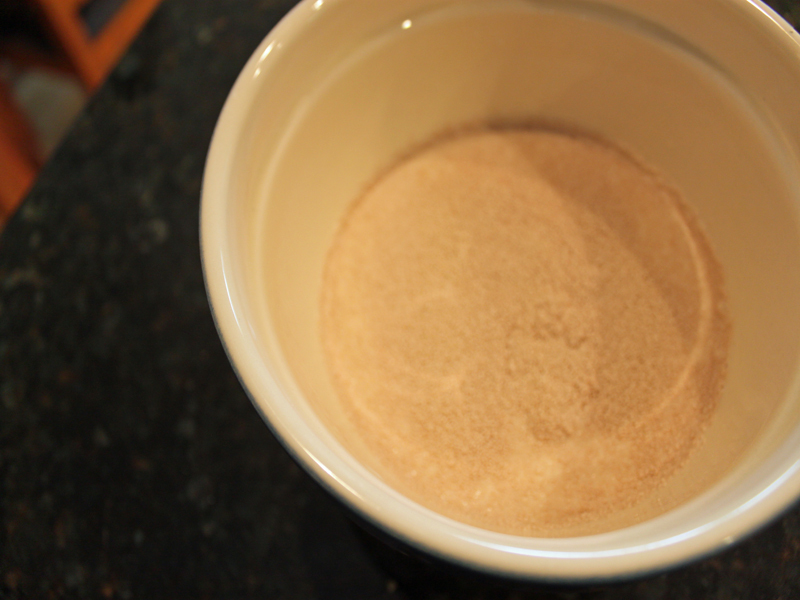 <h2>Step 1: Get Yeasty!</h2> Heat the soy milk to 105 degrees (not hotter) in a bowl, add the sugar and sprinkle the yeast on top of the mixture. Let it stand in a warm place until the yeast gets foamy. 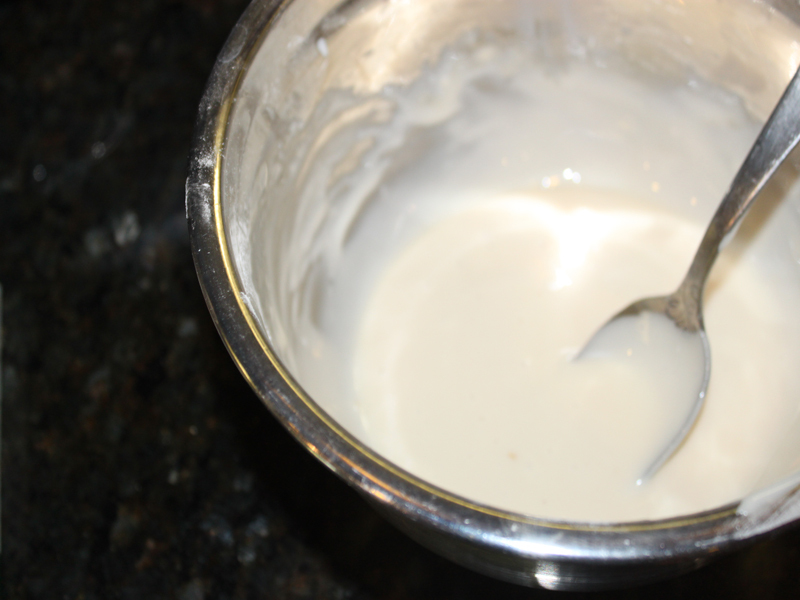 <h2>Step 2: Whisk It!</h2> In a separate bowl, whisk the flax seed with the warm milk-sugar-yeast mixture until it thickens. 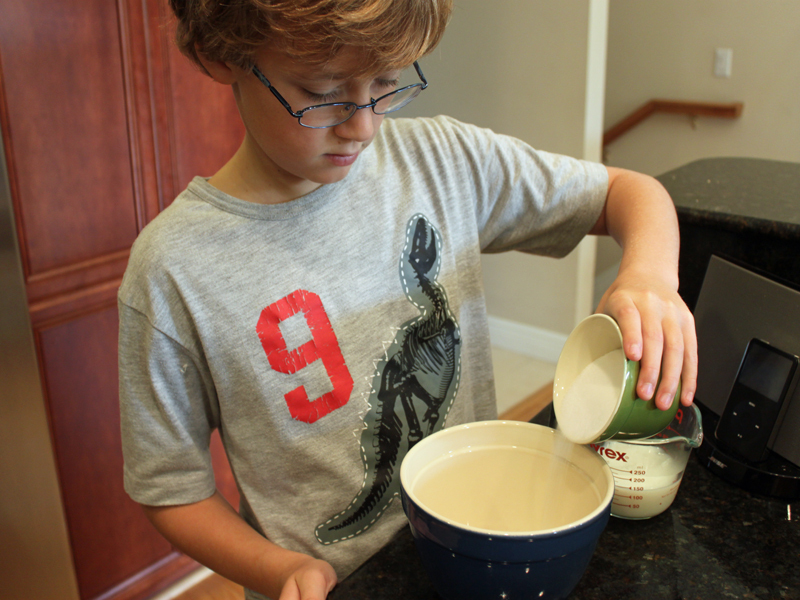 <h2>Step 3: Make the Dough!</h2> Add 1/3 of the Earth Balance (melted), along with the salt and flour to the warm milk-sugar-yeast-flaxseed mixture. 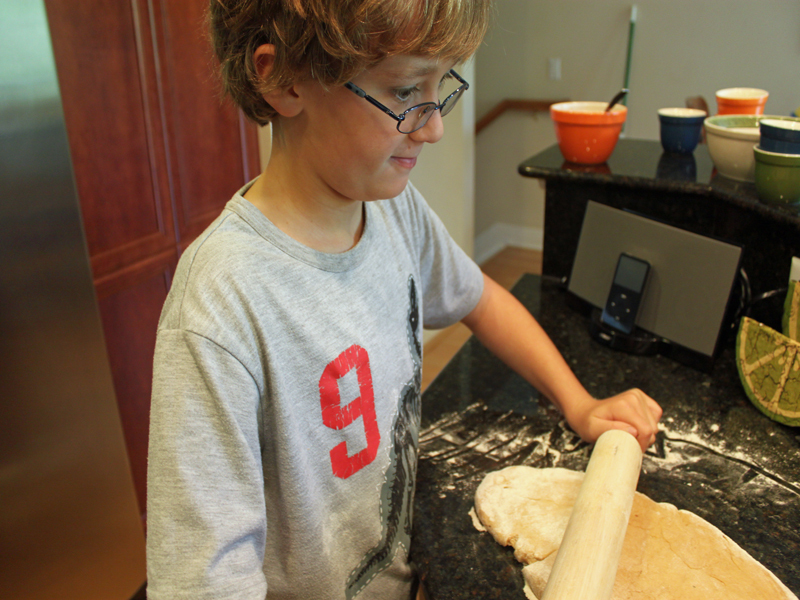 Mix until a large dough ball forms. <h2>Step 4: Knead It!</h2> Knead the dough ball for 5 minutes or until it is firm and smooth, if it is too sticky add a small amount of flour. If it is too dry, add a small amount of water. <h2>Step 5: Let It Rise!</h2> Place the dough ball in an oiled bowl covered with a dishcloth. 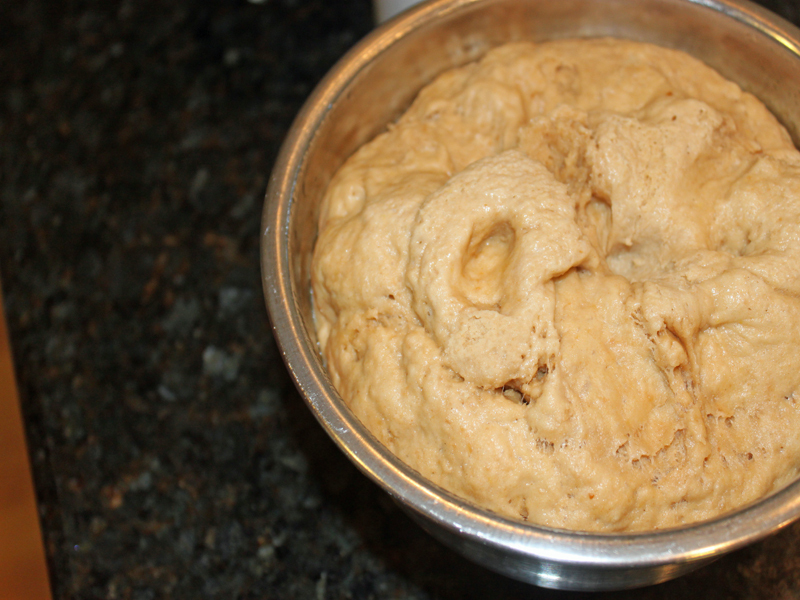 Then, place it is a warm area - such as a window sill and let it sit for 1 hour or until the dough doubles in size. 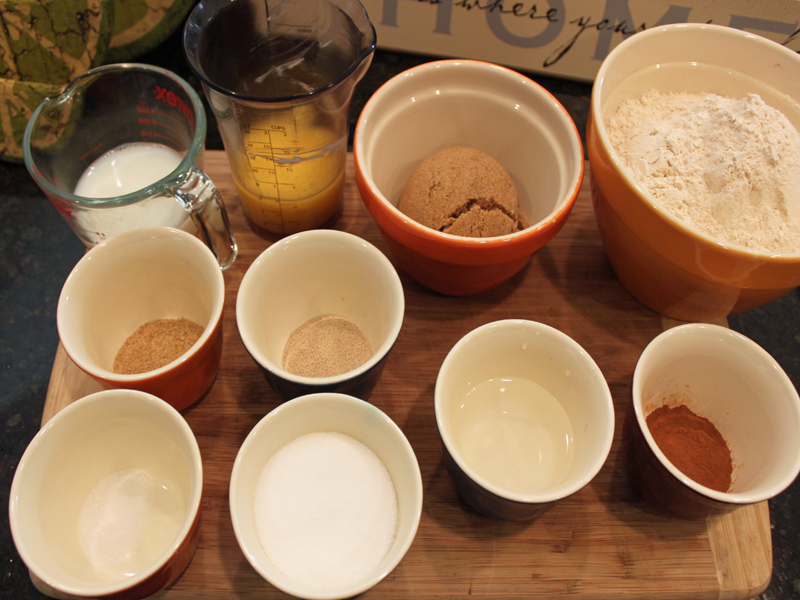 <h2>Step 6: Make It Sweet!</h2> While the dough is rising, mix the brown sugar, cinnamon and 1/3 melted Earth Balance in a bowl. 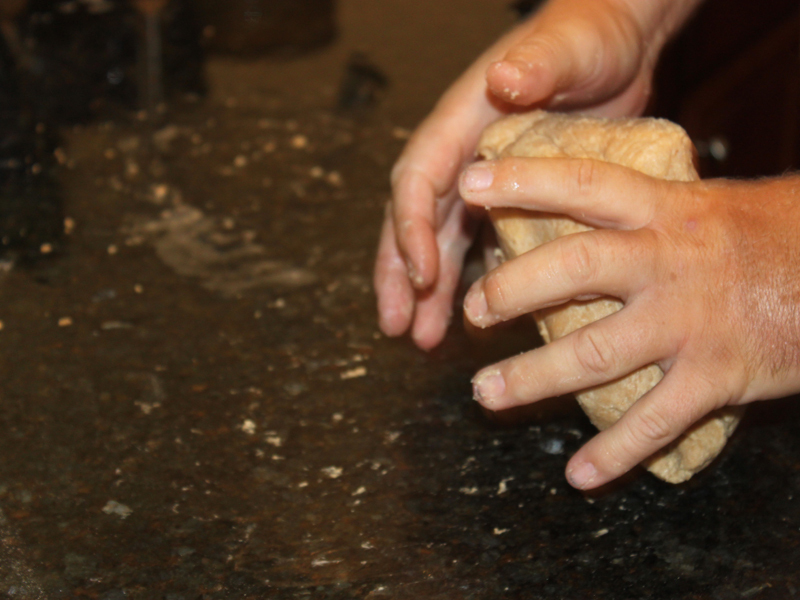 <h2>Step 7: Roll It Out!</h2> When the dough is done rising, roll it out on a well floured counter top until it is 1/4 inch thick. 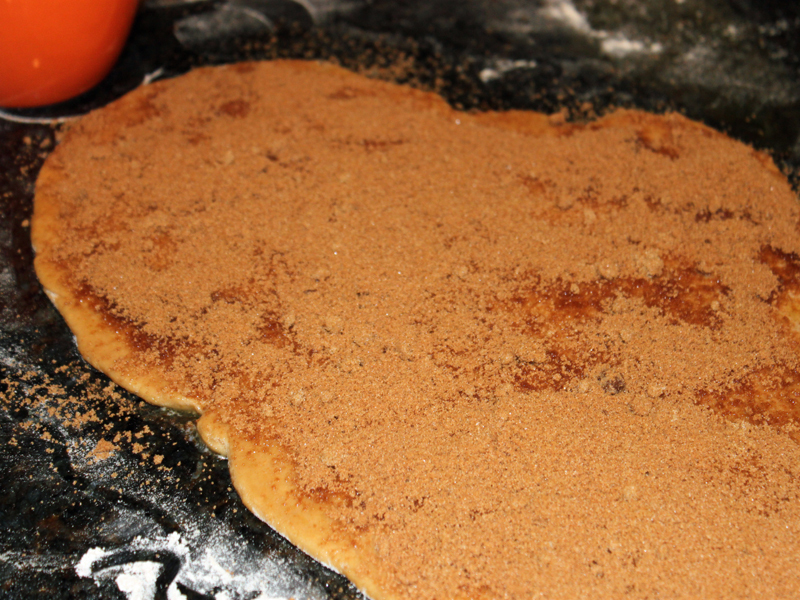 <h2>Step 8: Sweeten It Up!</h2> Add a layer of melted Earth Balance to the entire surface of the dough and then sprinkle a layer of the brown sugar-cinnamon mixture on top. 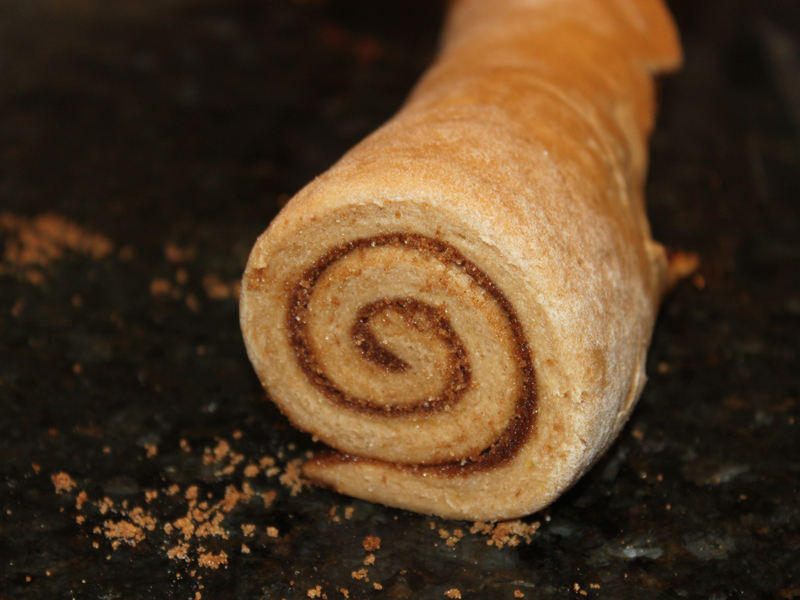 <h2>Step 9: Roll It Up!</h2> Roll the dough into a large log, then cut it into equal sized cinnamon rolls. We like to use a piece of plain dental floss to cut the rolls. Place them on an lightly oiled cookie sheet and cover with a dishcloth. Let them rise again for about 30 minutes - they will double in size. <h2>Step 10: Cut It Up!</h2> Then, cut it into equal sized cinnamon rolls. We like to use a piece of plain dental floss to cut the rolls. <h2>Step 11: Let It Rise Again!</h2> Place them on an lightly oiled cookie sheet and cover with a dishcloth. Let them rise again for about 30 minutes - they will double in size. 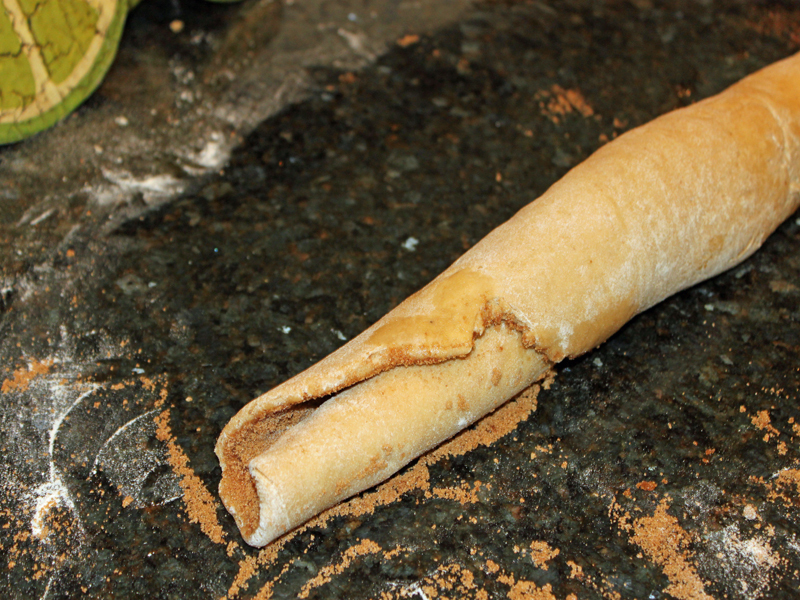 <h2>Step 12: Bake It!</h2> Heat your oven to 400 F and bake the cinnamon rolls for 10 minutes. 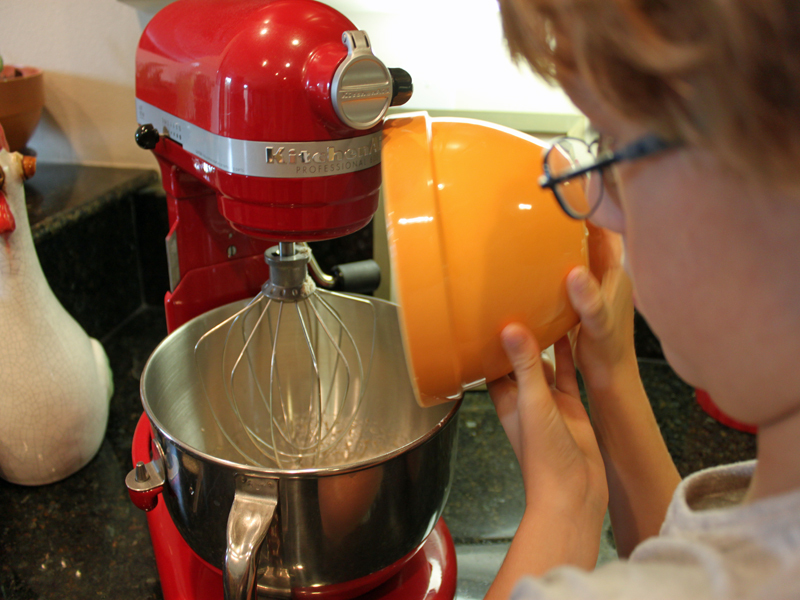 <h2>Step 13: Make the Icing!</h2> While our cinnamon rolls are baking, make your icing. Beat together all of the ingredients until smooth. 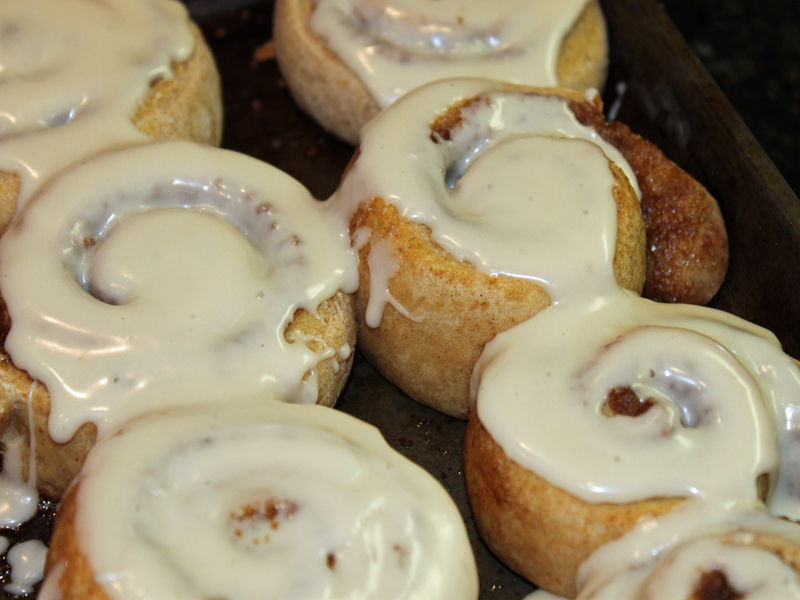 <!--nextpage--> <h2>Step 14: Add the Icing + Enjoy!</h2> Spread on the warm cinnamon rolls and Enjoy! 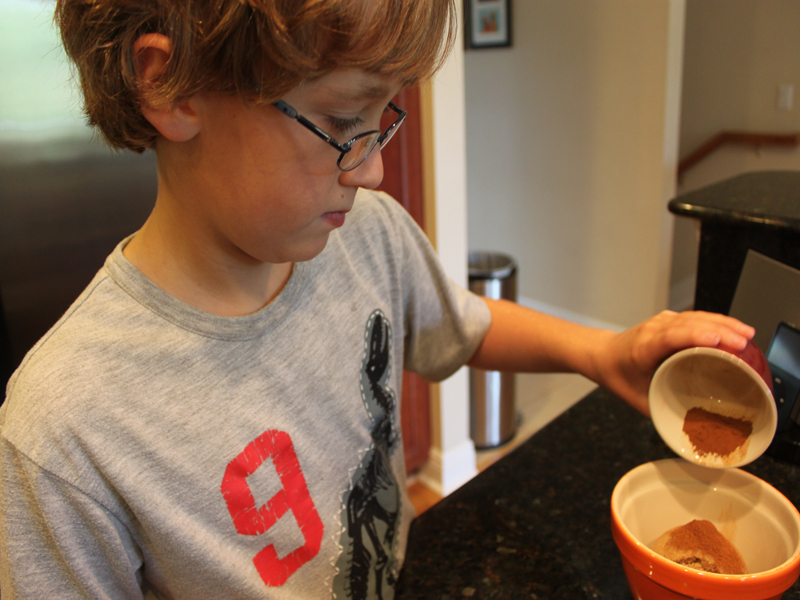 My son loves cinnamon rolls, but since most are chock full of white flour, sugar and fat, we rarely indulge. However, last weekend he begged me to make a batch. I was determined to make a batch that was organic, vegan, made with whole-wheat and still delicious. I'm happy to report that these cinnamon rolls fit the bill - and while we won't be eating cinnamon rolls everyday in our home, these are a great vegan alternative for those times that we feel like a sweet treat! 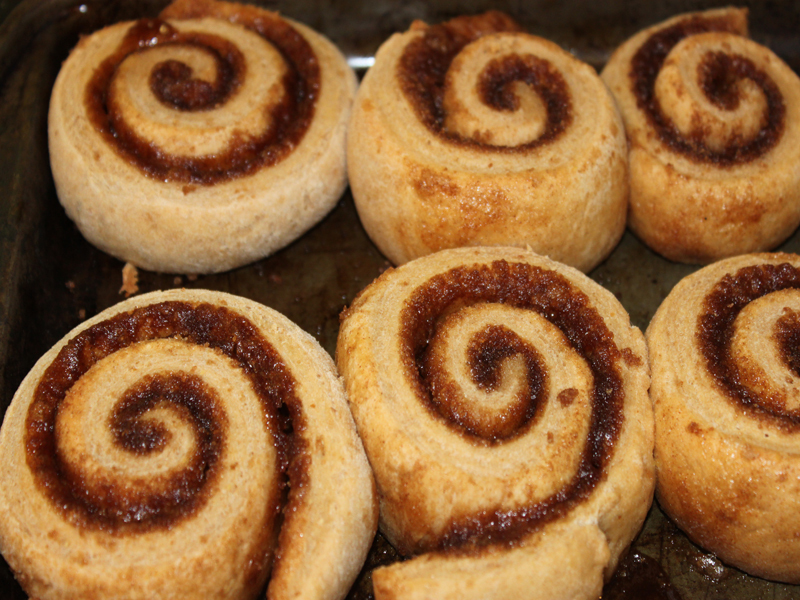 Read on to learn how you can bake organic vegan whole-wheat cinnamon rolls.